The development of a domain specific language (DSL) can be a difficult and costly undertaking. Language workbenches aim to provide integrated development support to ease this process. The Meta-Environment is a language workbench providing parsing, analysis, transformation, syntax highlighting and formatting support for the development of programming languages. 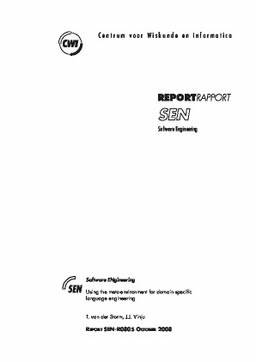 In this paper we elaborate on the suitability of it for DSL engineering by reporting on our experience in developing a little language for markup generation. van der Storm, T, & Vinju, J.J. (2008). Using the Meta-Environment for Domain Specific Language Engineering. Software Engineering [SEN]. CWI.